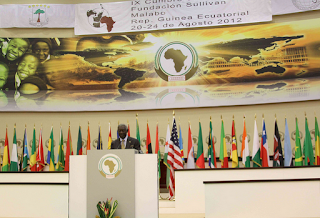 Equatorial Guinea hosted the IX Leon H. Sullivan Summit in Sipopo Conference Center in Equatorial Guinea on August 20-23, 2012. 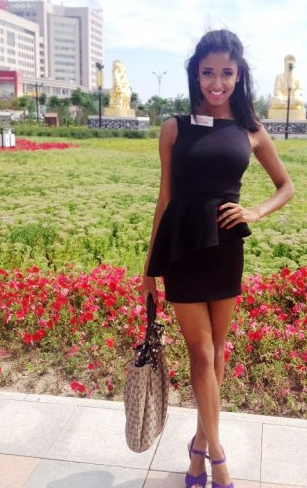 Ghyslaine Tchouaga, Miss Africa USA 2012, talks about her experience while visiting Equatorial Guinea. She first came to the West African nation in 2000 with her parents as a child. She says that her favorite thing about the country is the people - their friendliness and effort to go the extra mile in order to make foreigners feel welcome is something she finds especially impressive. 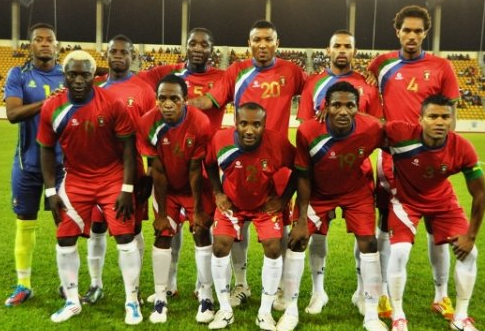 Ghyslaine, also known as Gigi, says that Equatorial Guinea has set an example for all African countries. In 12 years, Equatorial Guinea has developed significantly, which is not the case for many African countries. The nation, for instance, has built a great conference center, improved roads across the country, and maintained its cleanliness. Gigi was born in Cameroon, where she lived for 16 years before she moved to the United States. President Obiang Nguema Mbasogo of Equatorial Guinea closed the fourth day of the Leon H. Sullivan Foundation Summit with an assertive call for western nations to respect African decisions and allow Africans to resolve their own problems and engineer their own development. 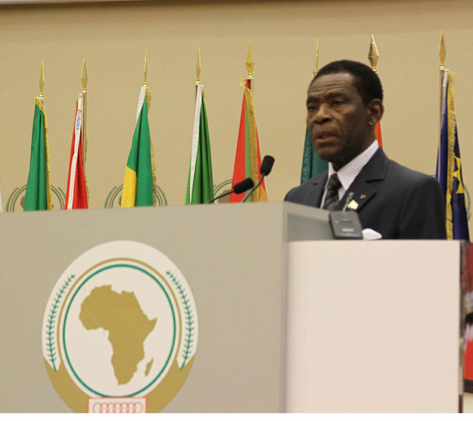 President Obiang urged the Leon H. Sullivan Foundation to focus on creating new structures to harness the renewed energy of Africa and African descents. Equatorial Guinea’s President closes Sullivan Summit with reminder that Africans are best qualified to resolve African problems. The fourth day of the conference, held at the Sipopo Conference Center in Malabo, focused on African governance. “We continue to work toward institutional reforms and democracy to reach the goals of the Horizon 2020 development plan and move closer to an emergent economy,” said President Obiang. In his closing remarks, President Obiang urged the Leon H. Sullivan Foundation to focus on creating new structures to harness the renewed energy of Africa and African descents. The last day of the Sullivan Summit held an afternoon session, where a dynamic group of renowned women, including Anastasia Nsang Nse Ada, Economist, Tanya Kersey, President of the Hollywood Black Film Festival, among others, shared their insights, experience and tips for successfully navigating life’s challenges and attaining one’s dreams. Teodoro Nguema Obiang Mangue, Equatorial Guinea’s Second Vice President, Head of Defense and State Security, is sponsoring the continuation of the national campaign to donate zinc plates. The delegation distributing the zinc plates resumed in Niefang district on August 6, and gradually made its way toward Acurenam and Evinayong and the capital of Centro Sur. It then moved to Wele-Nzas. The zinc roof campaign is dedicated to helping disadvantaged families in rural areas replace their nipa roofs with zinc plates. It was launched last year as part of the government’s efforts to improve the living conditions in rural communities. Over 110,000 zinc sheets were distributed in the Centro Sur province. The campaign then continued throughout other areas of Wele-Nzas, where it would eventually be completed. Equatorial Guinea has hosted the third day of the Leon H. Sullivan Foundation Summit at the Sipopo conference Center in Malabo. The third day’s session focused on foreign investment, industrial development initiatives, human rights and the engagement of the African diaspora with modern Africa. During an open forum, Gabriel Mbaga Obiang Lima, Minister of Mines, Industry and Energy, discussed foreign investment, economic growth and industrial development initiatives underway in Equatorial Guinea and outlined ways to form economic alliances that can continue to drive national development. Equatorial Guinea development is based on the Horizon 2020 plan. The West African country is investing its oil resources to establish the physical, intellectual, and institutional infrastructure for a diverse economy and to prepare the country for the day when oil production declines. President Obiang Nguema Mbasogo has also developed the “Education for All” initiative, which has placed a priority on increasing school enrollment, forming strong professions, and building and remodeling primary and secondary schools, and expanding the scope of university education. Ecuatorial Guinea currently has some 6,000 students enrolled in two national university campuses, and plans new campuses to serve more students and offer more disciplines. Recently, the World Health Organization (WHO) named Equatorial Guinea leader in health care investment in Africa, with Botswana following close behind, at an annual health care spending of $612 per capita. The plenary session focused on the potential of the African diaspora to contribute to Africa’s growth through knowledge transfer, cultural exchanges and financial investments. The speakers stressed that it is important for the African diaspora to return to the continent and help African countries move forward. “The Sullivan Summit is a bridge for the African diaspora to come back to the continent, to see and help Africa,” said Hope Sullivan Masters, President and CEO of the Leon H. Sullivan Foundation. On August 18, Equatorial Guinea’s Jennifer Riveiro participated in the Miss World Pageant 2012, in Ordos, China, a city located at the heart of China’s rich coal country. Ms. Riveiro was one of 122 young representatives, and it was her first time participating in the pageant. Ms. Riveiro got involved after winning the Miss Beauty of Equatorial Guinea 2012 pageant last April. She was born in Malabo and is currently in her third year at the National University of Equatorial Guinea. Although Yu Wenxia, Miss China, was crowned Miss World on Saturday night, Riveiro represented Equatorial Guinea with pride and appreciation for her country. "I am a proud representative of Equatorial Guinea, a State of Central Africa, peaceful and prosperous, in which are combined wild nature and modernity,” she said. “I am very excited with this experience, which I hope will be unforgettable, and in the future I would like to dedicate myself to politics." The first runner-up was Sophie Elizabeth Moulds of Wales and the second runner-up was Jessica Michelle Kahawaty from Australia. The Government of Equatorial Guinea’s zinc roof initiative continued in the province of Wele-Nzas last week. Over 13,000 zinc sheets were distributed throughout the province, reaching towns such as Ayana Concentrado, Ayene Concentrado, Kumankoc and Etom, among others. The zinc roof campaign was a government-sponsored initiative, led by Second Vice President, Head of Defense and State Security, Teodoro Obiang Nguema Mangue, designed to help families in rural communities by replacing their nipa roofs with zinc plates. To further enhance living conditions within these rural communities, Teodoro Nguema Obiang Mangue traveled with a group of well-equipped physicians who treated people who were sick with limited access to resources. According to the Second Vice President, this tour aimed to deliver zinc sheets as well as communicate with the population. It provided the government the opportunity to address the nation on television and express thanks for the individuals and companies that donated money to the project. It also granted the Second Vice President a chance to call on the international community to help support the initiative by providing necessary resources and assistance to ensure its sustainability. The tour, which continues in Añisok, will help address additional needs in the communities, such as improved health and education centers, by permitting the public a chance to request certain changes. 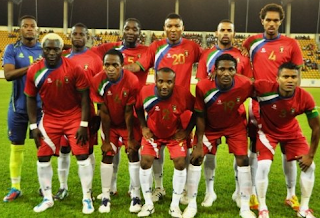 “Equatorial Guinea is committed to move forward. We have heavily invested in infrastructure, education, health care, and human capital, among other things. This year UNESCO reported a 93% literacy rate in Equatorial Guinea, the best in the region. We have La Paz Hospital, a state-of-the-art facility,” said Minister Mba Mokuy. The Foreign Minister highlighted the country’s increased growing international involvement. Fifteen years ago, he said no one knew where Equatorial Guinea was; he said now everyone knows. He said the people support President Obiang Nguema Mbasogo because he brought them out of misery. Both ministers stressed that Equatorial Guinea is open to the media. They invited guests to come to the country and see with their own eyes what the country has to offer. The Horizon 2020 development plan is President Obiang’s vision to prepare the country for the decline of oil production and strengthen the physical, intellectual, and institutional infrastructure for a diverse economy. Today’s agenda was focused on Africa’s intensified efforts to develop its human capital. Discussions at the plenary session dealt with innovative approaches to African-led partnerships in relation to peacekeeping, post-conflict reconciliation and the protection of citizens for socio-economic growth. The second day also focused on increasing youth involvement, investing in higher education, and leadership-training programs for building effective sustainable education programs. Equatorial Guinea’s second vice president, the country’s top national security official, Teodoro Nguema Obiang Mangue, toured military barracks last week promising better living conditions in exchange for better behavior. Equatorial Guinea has worked to improve a number of industries and national sectors in recent months, including military living conditions. The government has also worked to enhance telecommunications by establishing GITGE (Management and Maintenance of Telecommunication Infrastructures organization in Equatorial Guinea) and the public health sector by awarding scientists the UNESCO-Equatorial Guinea prize to continue their work in addressing global health issues. 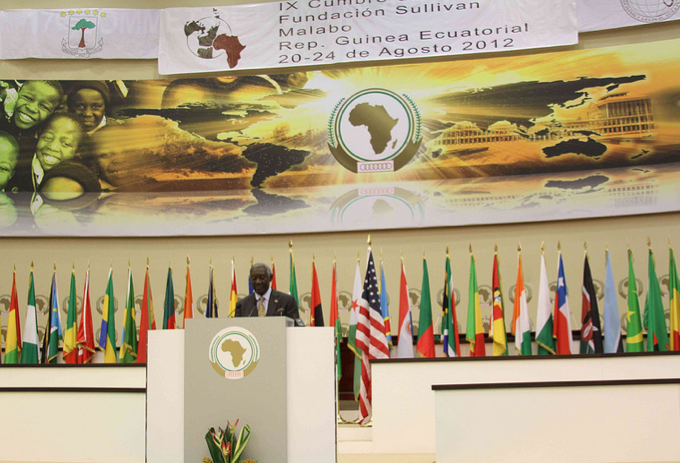 Equatorial Guinea has hosted the first day of the 9th Biennial Leon H. Sullivan Foundation Summit, which is being held in Malabo’s Sipopo Conference Center from August 20-24, 2012. Opening speech by H.E. the President of the Republic of Equatorial Guinea. This year’s Sullivan Summit is focused on the continent’s development objectives under the theme of “Africa Rising,” and will address critical human rights issues as they relate to food security, human security, freedom of the press, education, civil-society development, gender empowerment, innovation and youth development, and building economies of opportunity. Through financial investments and the transfer of knowledge, the African Diaspora is having a significant impact on African development. Today’s Sullivan Summit Plenary Session has focused primarily on reuniting the African Diaspora in order to form key partnerships that will shape African growth. Equatorial Guinea has been increasingly active in African affairs in recent years. It has used its oil resources to provide emergency humanitarian assistance to its African neighbors, and it has conducted a robust regional foreign policy featuring bilateral summits, citizen exchanges, technical assistance and investment promotion. It has also hosted a number of regional conferences in its new facilities in Sipopo. Purificación Angue Ondo, the ambassador of the Republic of Equatorial Guinea to the United States, will host a welcome reception for the newly appointed U.S. ambassador to Equatorial Guinea, Mark Asquino, on August 3 at the Equatorial Guinea embassy. Expected attendees are representatives from the Washington D.C. business community, including Marathon Oil and Hess, and Department of State officials including Assistant Secretary for African Affairs Johnnie Carson. Ambassador Asquino is a career foreign service officer holding the rank of minister counselor and currently serves as the executive assistant in the Office of the Under Secretary for Civilian Security, Democracy and Human Rights at the Department of State. He previously served as a senior public diplomacy fellow at The George Washington University and deputy chief of mission at the U.S. embassies in Sudan and Kazakhstan. Purificación Angue Ondo has served as ambassador to the United States since 2005. Prior to this appointment she was president of the U.N.’s Africa Region Coordinating Committee for the Integration of Women, Central African Sub-region.